The increasing government initiatives are growing awareness regarding benefits of clostridium vaccine among consumers. Clostridium vaccines are used to provide immunity against for a variety of ovine and bovine clostridial diseases such as tetanus, black disease, pulpy kidney (enterotoxaemia), and blackleg. The increased awareness pertaining to zoonotic diseases and the rising incidence rate of clostridium family diseases are boosting the demand for clostridium vaccine globally. In developing countries, distribution of these vaccines are mainly dependent of government intervention. Whereas, in developed nations, the distribution is dependent upon veterinary hospitals and veterinary clinics. To prevent zoonotic diseases and loss of animals, governments, veterinary hospitals, and veterinary clinics are persistently commencing awareness programs. It is estimated that the global clostridium vaccine (animal health) market will expand with a steady CAGR of 4.9% throughout the period 2016-2024. Growing with this rate, the market is most likely to reach the value of $643.5 mn by the end of 2024, from its initial value of US$418.0 mn in 2015. 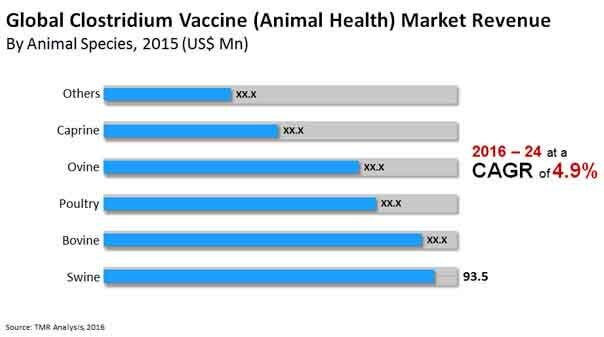 The global market for clostridium vaccine can be segmented on the basis of animal species into poultry, swine, caprine, ovine, and bovine. Among these, the swine segment is expected to provide most attractive opportunities for the market growth owing to large demand of pork. Furthermore, the segment is expected to expand with a significant pace due to high possibility of swine getting diagnosed with zoonotic diseases. However, over the forecast period, the ovine segment is anticipated to project the fastest rate of growth. The increasing prevalence of diseases such as black quarter, black diseases, and blackleg are propelling growth of this sector. Furthermore, government regulations in various geographies, growing awareness among owners, and the massive increase in the world's ovine population are envisioned to surge the demand for this segment over the forecast period. On the basis of distribution Channel, the market for clostridium vaccine can be bifurcated into retail pharmacy, veterinary research institute, veterinary hospital, and veterinary clinic. Among these, due to technological advancements and development of overall retail industry, retail pharmacy segment is foreseen to expand with an uninterrupted growth rate. In Asia Pacific, the veterinary clinic segment holds a dominant position in the market owing to augmenting government awareness pertained to clostridium diseases and their prevention, across several countries over the region. On the basis of geography, the clostridium vaccine (animal health) market can be divided into five key regions, namely Middle East and Africa, Latin America, Asia Pacific, Europe, and North America. OF these, the North America segment is expected to grow with a noteworthy rate due to increasing awareness among customers. The increasing demand for meat products and the decreasing arable land are other factors leading to the growth of the market within this region. The developing region, Asia Pacific is also foreseen to provide lucrative growth opportunities owing to the increased government initiatives. The increasing population of countries such as China and India are demanding for meat products. Furthermore, the rising prevalence of clostridial diseases over these countries are most likely to generate high demand for clostridium vaccines, further assisting the expansion of the global market. Some of the prominent players operating within this market include Bayer AG, Ceva Sante Animale, Bimeda, Inc., Vibrac Corporation, Eli Lilly and Company, Boehringer Ingelheim, Sanofi-Aventis (Merial Animal Health), Merck Animal Health, and Zoetis, Inc.